The X Factor has come out on top against Strictly Come Dancing with up to two million more viewers than its rival, according to overnight figures. ITV's X Factor had an audience of 10 million while 7.7 million watched the BBC's dance show as it drew to a close. Tennis star Martina was the first famous face to be voted off Strictly. Strictly failed to beat The X Factor at any point during their direct clash, peaking at 8.1 million just before the ITV programme came on. Friday evening's series opener for the ballroom show gained an average audience of 8.4 million, reaching a peak of 8.9 million viewers. A BBC spokesman said the figures were "very pleasing". He added that there had been schedule overlaps on 40 previous occasions, and a combined audience of 19 million showed "there is something for everyone to enjoy on Saturday night". There are no immediate plans to reschedule Strictly Come Dancing, the spokesman said. 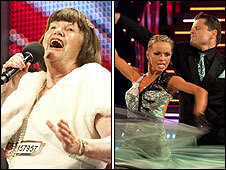 While The X Factor continued to showcase pre-recorded auditions, the BBC One dancing show was live and culminated in the departure of Hingis from the competition. She was beaten in a dance-off by Crimewatch presenter Rav Wilding. The Swiss star said: "It was a great experience, I learned so much. I wish it would continue but here we are." Actor Ricky Groves, BBC sports reporter Chris Hollins, athlete Jade Johnson, boxer Joe Calzaghe and actresses Ali Bastian and Lynda Bellingham were safe. Votes cast by the public were added to the judges' scores, leaving the two dance pairs with the lowest scores to fight for survival in the dance-off. 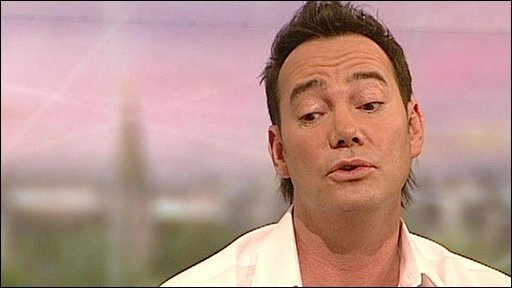 Judges Alesha Dixon and Craig Revel Horwood then voted to keep Hingis and her dance partner, Matthew Cutler - who partnered Dixon to victory in 2007 - but fellow judge Bruno Tonioli voted for Wilding. The casting vote went to chief judge Len Goodman, who also backed Wilding and his dance partner Aliona Vilani. Reacting to the decision, Hingis added: "Maybe I will come back for a few more lessons to London." Next week's contestants in the seventh series of the show include former EastEnders actress Natalie Cassidy, Footballers' Wives stars Zoe Lucker and Laila Rouass and Jo Wood, the estranged wife of Rolling Stone Ronnie Wood. The remaining four are former jockey Richard Dunwoody, Coronation Street actor Craig Kelly, ex-cricketer Phil Tufnell and Hollyoaks star Ricky Whittle. The first two shows marked the debut of former winner Alesha Dixon as a judge, replacing Arlene Phillips. The singer has received some negative reaction from viewers, with comments on the show's official website message board saying that she lacks the experience required for the job. What happens at an X Factor audition?